NB: From 01/01/2018 there is a new city tax that must be paid directly from the clients to the hotel upon arrival. DAY 1. Arrival in ATHENS. You will be met at Athens airport and transferred to your hotel. Rest of day explore Athens on your own. Overnight in Athens. DAY 2: Morning city sightseeing tour After breakfast depart for your city orientation sightseeing tour, a combination of modern and old Athens. Stop and take photos at the Panathenaiko Stadium (Built in the 2nd century AD, it is the only stadium in the world built entirely of marble, and became the host to the opening and closing ceremonies of the first modern Olympics in 1896), Temple of Olympian Zeus, Hadrian’s Arch, Constitution Square (Syntagma), the Parliament with the Unknown Soldier memorial, the Academy, University, National Library, trilogy of Athens. 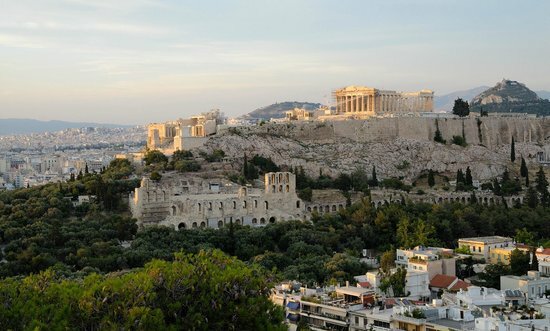 You continue with a visit to famous ACROPOLIS, perched high on a rocky outcrop overlooking the city. Here, you ‘ll see the Parthenon, the Erechtheion with its Karyatides Porch of Maidens, the Temple of Athena Nike, and enjoy a panoramic view that includes glimpses of the Temple of Olympian Zeus, Theater of Dionysus, and the Greek Agora, where Socrates taught, with the beautifully preserved temple of Hephaestus or Theseion. The last site in the tour is the visit to the New Acropolis Museum. The tour ends at 13:30. In the evening enjoy a delicious Greek dinner on join an optional dinner outing and enjoy Athens’ nightlife. Overnight in Athens. DAY 3. Day of departure from ATHENS. Transfer to the airport/port for departure. 2019 Price per person 3 star central hotel 190.00 € p.p. | 4 star central hotel 250.00 € p.p. * 2 nights hotel stay with breakfast in a shared double room. Single room upon request. * Arrival & departure private transfers from/to airport / port. * You may extend your stay upon request by paying the extra night charge. * Submit the booking form. All your details are safely protected by a secure connection. Enjoy the highlights of Athens, the Peloponnese, and the mountains of central Greece as you discover the history and legend behind the classical sites of the Acropolis, Mycenae, the sanctuaries of Apollo in Delphi and Zeus at Olympia, and on the last day of the tour visit the byzantine monasteries at Meteora. DAY 1. ATHENS: Transfer to your hotel. Rest of day at leisure. Overnight in Athens. DAY 2. ATHENS: Morning sightseeing tour of Athens. Rest of day free. Overnight in Athens. Museum, recently voted one of the best museums in the world. Enjoy the afternoon at leisure in Plaka, a historical and picturesque part of the city. Take a stroll through the cobbled streets or relax with a drink at one of the many tavernas in the area. Overnight in Athens. DAY 3. ATHENS / EPIDAURUS / NAFPLION / MYCENAE / OLYMPIA. We depart Athens and head for the Peloponnese, a region which was the setting of many great myths and legends. Our first stop is the narrow Corinth Canal, a man-made waterway completed in 1893 after centuries of attempts. We continue to the beautifully preserved theatre at Epidaurus, a sanctuary famed for medicine & healing in antiquity. Next we visit the World Heritage site of Mycenae, the early civilization excavated by Heinrich Schliemann; here we’ll see the Cyclopean walls, Tomb of Agamemnon, and Lion Gate. Continue and overnight at Olympia. (Dinner). DAY 4. OLYMPIA/DELPHI. Olympia is a fascinating step back in time to the birth of one of modern days biggest sporting events. In the morning visit the Sanctuary and the Museum of Olympia. You will see the Temple of Zeus, the Palestra and Pheidia’s workshop. Heading north this afternoon, we cross the impressive Rio-Antiro Bridge before arriving for overnight in Delphi (Dinner). DAY 6: KALAMBAKA – ATHENS. 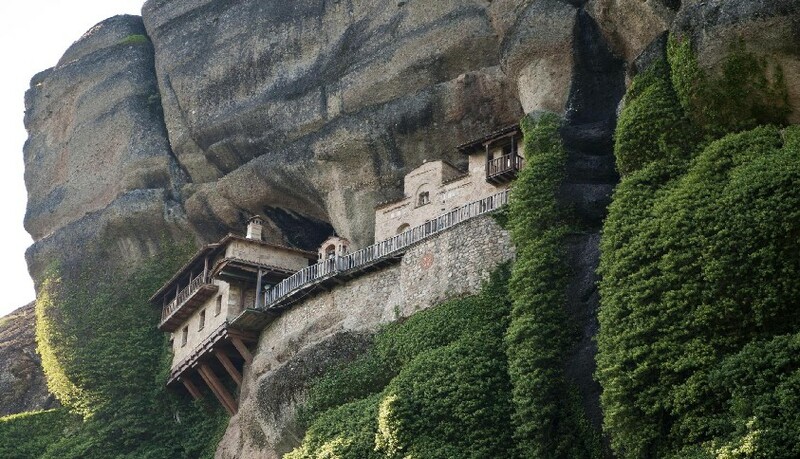 This morning we visit Meteora, a stunning World Heritage site where a series of towering rock formations shelter several sacred Eastern Orthodox monasteries. We return to Athens for overnight. DAY 7. ATHENS / AIRPORT: Last day in Athens. Transfer to the airport for departure. Accommodation 6 nights in 3 or 4 star carefully selected hotels. Note: All the hotels are good. It’s their location that makes the price difference. Guided sightseeing is in a shared bus. Visit Athens, Olympia, Delphi, and Meteora tours. * You will join travellers who booked through other operators, staying in different hotels. * The group size varies from 15 – 35 persons. * Services of a tour guide for all scheduled sightseeing. Guiding may be in an additional language to English. Not included: A hotel tax of €3.00 for 4*, or 1.50 € for 3* hotels per night to be paid to the hotel at time of check in.